The airFiber X antenna delivers 2x2, dual-polarity performance. 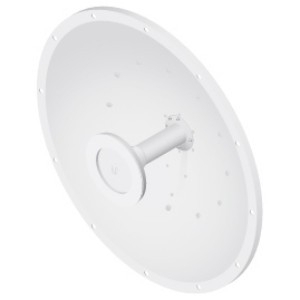 AirFiber X antenna with an airFiber X radio can be deployed as endpoints in a backhaul link to deliver bandwidth from a WISP network out to a neighborhood tower. From there, an airMAX® Sector antenna with a Rocket™ radio delivers bandwidth to the WISP’s customers. Snap the airFiber X radio securely into place and mount the antenna; you then have the optimal combination of airFiber X antenna and airFiber X radio for your PtP application. Protective Shroud protects the cables and connectors from the elements. The airFiber X supports ± 45° slant polarization for improved noise immunity and Signal‑to‑Noise Ratio (SNR). The airFiber X antennas are purpose-built with 45° slant polarity for seamless integration with the airFiber X. The AF-3G26-S45 offers 26 dBi of gain in a 650-mm diameter size.